There seems to have been a few books about irascible old men recently, including the wonderful ‘A Man Called Ove’ of course and ‘The 100 Year Old Man Who Climbed Out of the Window and Disappeared’. Could Hendrik Groen be another one of these grumpy but lovable characters? Well yes he is: I have grown very fond of him as I read his secret diary. 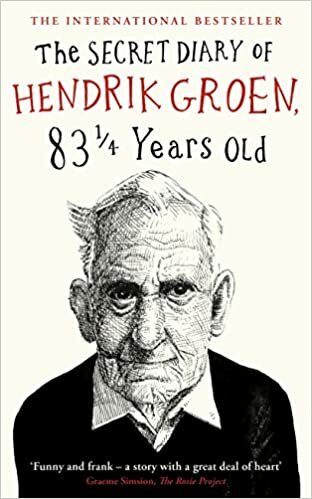 Written by a so-far anonymous author, The Secret Diary of Hendrik Groen, 83 1/4 Year Old has been a huge hit in its native Netherlands and I can see it repeating that success in the UK too. At 83 1/4 Hendrik lives in a care home, though it sounds to me more like what we would call sheltered housing in the UK. The residents live fairly independently in their own apartments and are able to go out and about as they wish and as their mobility allows. They come together for meals and recreational activities organised by the staff. Hendrik has decided to write this diary partly to show what life is like for the elderly in a care home but also to keep his mind active. And what an enjoyable read his diary is! Hendrik is such a wonderful character. He takes a pragmatic view of the ageing process, accepting his limitations but not accepting that at his age he should be taking things easy. In fact, with a group of select residents he is part of the Old-But-Not-Dead group, a name which just sums up the attitude of its members perfectly! Their fortnightly outings were something I think I anticipated as much as they did and showed that being elderly doesn’t mean all fun should stop. Within the pages of the diary there are a lot of touching moments too as Hendrik experiences an unexpected romance and also shows his caring side as some of his friends suffer accidents or illnesses. These combine to give more meaning to his own life and indeed, almost give him a new lease of life – as much as you can have when you have a mobility scooter anyway. The importance of friendship at any age comes through clearly throughout the book. The diary gives, I feel, a very honest picture of what life might be like in our ‘twilight years’. Issues such as care for the elderly, the increasing occurrence of dementia and euthanasia are all sensitively included. The characters within the diary’s pages have the same hopes, dreams and feelings as anyone else, they are just a bit more restricted by health and mobility issues. The translation is excellent with no hint that this was ever in another language, barring the Dutch names of people and places. I hope that if I reach Hendrik’s age, I am as sharp-witted, compassionate and wise as he is.